Nokia, the world leader in mobility has announced the latest E-series handset, Nokia E63. The new handset is designed for people who need to manage their business and personal lives equally well. According to Nokia, the Nokia E63 is still very much a member of the E-series family that offering Wi-Fi connectivity, easy to access corporate mail, calendar, and business contacts as well as the QWERTY keyboard that offered in Nokia E71. The Nokia E63 also has the ability to switch the modes with a single key press. There have two modes which are personal mode and corporate mode. In personal mode, the E63 offer with a different home screen picture, personal mail and shortcuts to blogs or websites. While, in corporate mode it offers with corporate mail, appointments and intranet data. The handset will also include Files on Ovi which is a service that allow users to access their PC remotely even the computer is offline. Beside that, it also include a range of multimedia features such record, view images, video, listen to music downloaded from Nokia Music Store and etc. 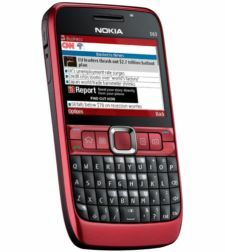 Nokia E63 will be available in ruby red or ultramarine blue at the price of approximate $244.